AD Console is a complete management toolkit for administrators to maintain users on Active Directory. The Active Directory Management Console Software features ensure instant and one-click management of Active Directory, which enables preview before implementation. 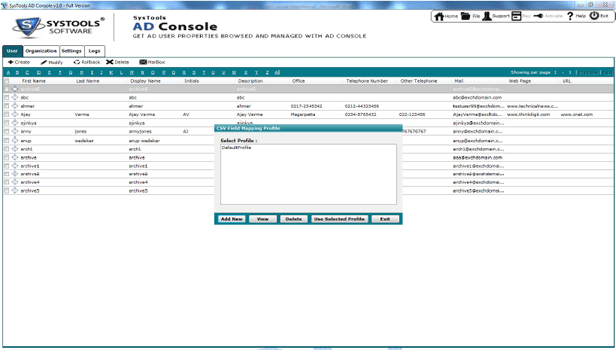 Active Directory Management Console Software is capably built with the potential to allow user management in the most simplified and instant manner. 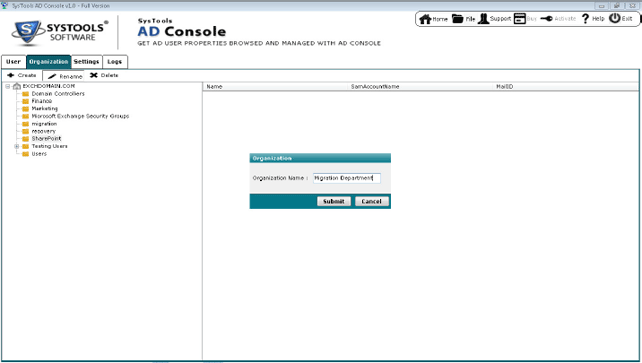 Administrators can maintain users in one-click with the software. 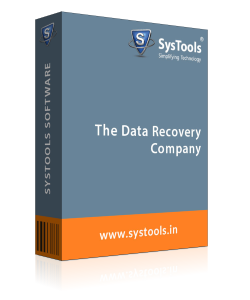 User creation and maintenance can completely be managed with the help of this Active Directory Management console Software. Exchange Server active directory users can either be created, edited, or modified or even the creation can be rolled back with the help of this Software. 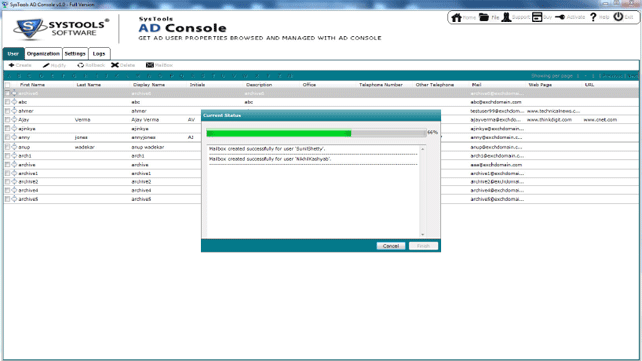 Before the implementation of any action on the existence or deletion of any user from the Exchange Active Directory, the AD management software offers a preview. 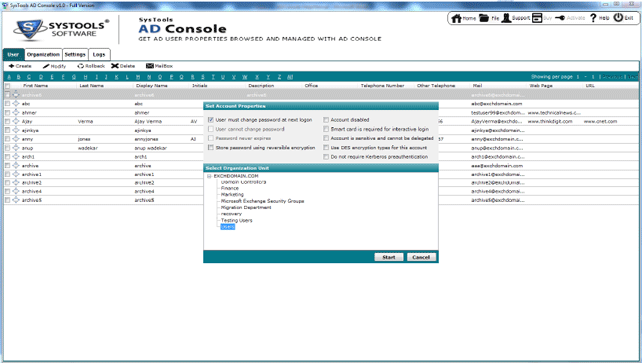 Preview the user details along with complete properties for distinguishing before Active Directory management. 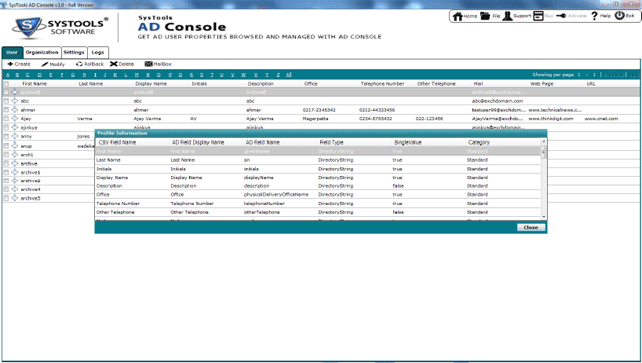 The Active Directory Console Software features creation and management of users on Exchange Server AD. 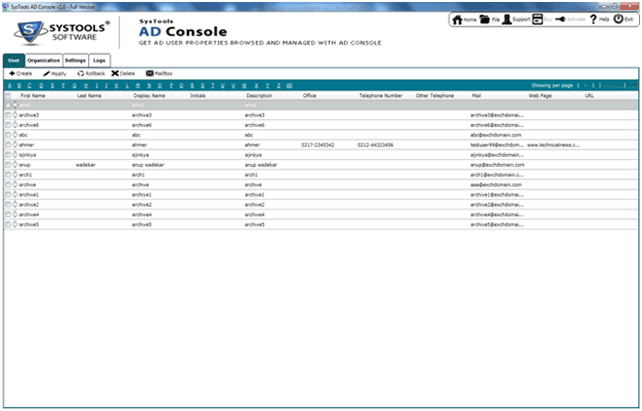 In addition, the AD management Software features direct user mailbox creation on the server AD right from the home screen for added convenience. 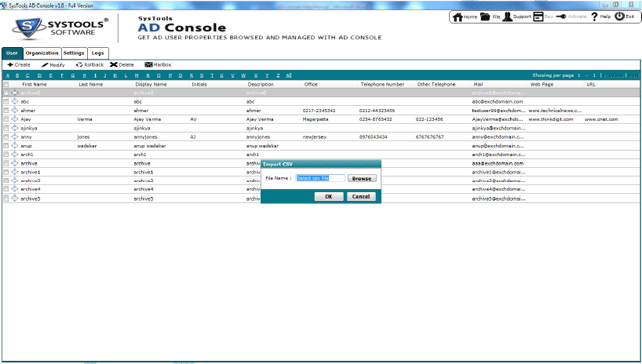 The Active Directory file manager Tool to manage Active Directory offers a number of features for the management of users on Exchange. 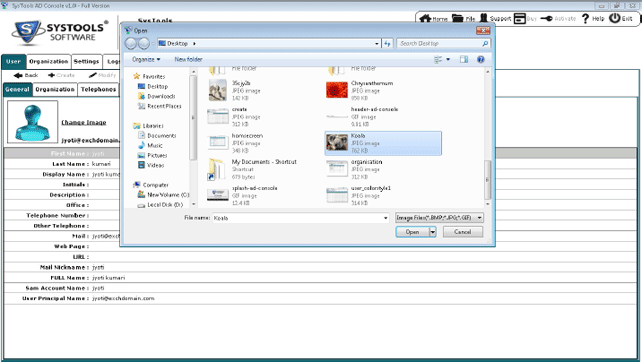 However, the product also offers an additional option to move users from one organizational unit to another or easy removal. 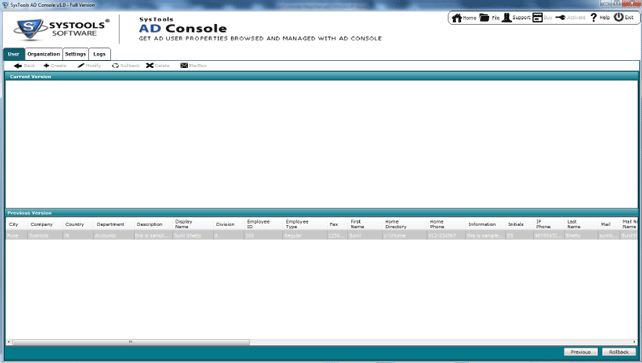 How to work AD Console software? 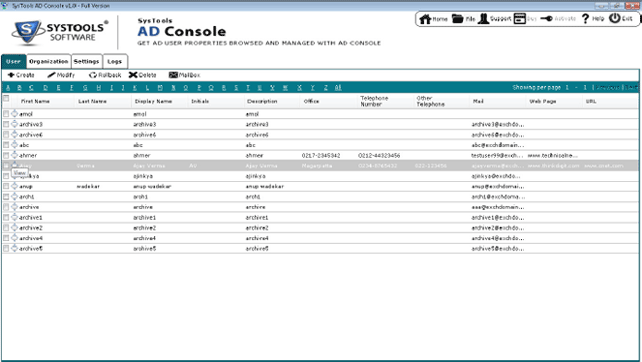 The AD Console Software will allow the user to display properties of active directory user and manage active directory. 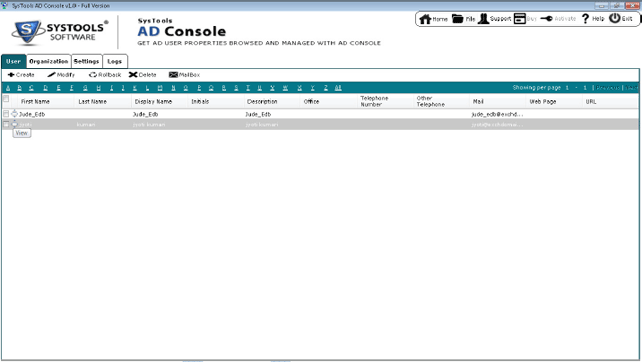 Step 2 : Click on “Active Directory Manager” option to view the Active Directory users. 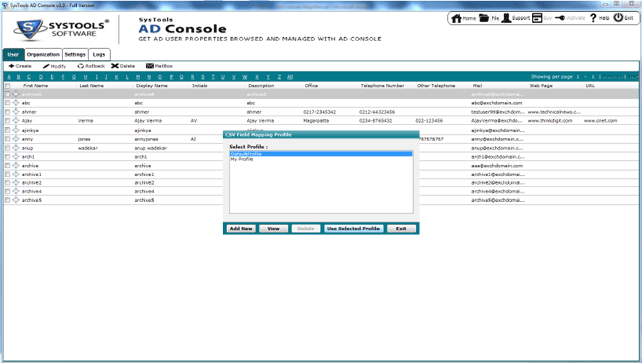 Step 4 : If you want to see particular User Properties, click on "View" option for that user. 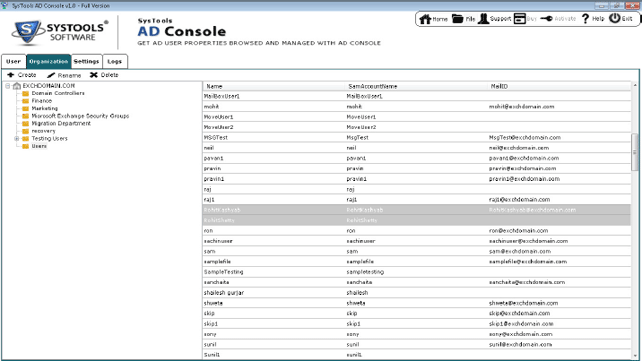 Step 5 : When you click on "General" tab, you can see general user properties. When clicking on additional tabs (Organization, Telephone, Address, Account, Profile and Member OF) and see similar properties also. Step 6 : Apply or Change User Image Choose the user whose image you want to change or apply the image. Step 7 : Click on "Change Image" link and then choose the image that you want to apply. Step 8 : Creating Organization Unit: Choose the location the tree structure (In root or under particular organization) where you want to build organization system and then click on "Create" Option Now enter the Organization Name that you want to Create and then click on the "Submit" button. Step 9 : Rename Organization Unit Choose the organization unit that you require to rename from tree view and then click on "Rename" option Now enter the new Organization System name that you want to rename, then click on "Submit" button. Step 10 : Delete Organization Unit Choose the organization unit that you want to remove and then click on "Delete" button. Now click on "yes" option if you want to delete that organization Structure. Step 11 : Move users from one Organization Unit to Another: Choose the organization unit that contains the users that you need to move. Step 12 : Now Drag the users that you want to move to that particular Organization. Click on "Yes" option if you want to move users from source organization to another organization Unit. Choose the fields that you require while creating users or modifying users. 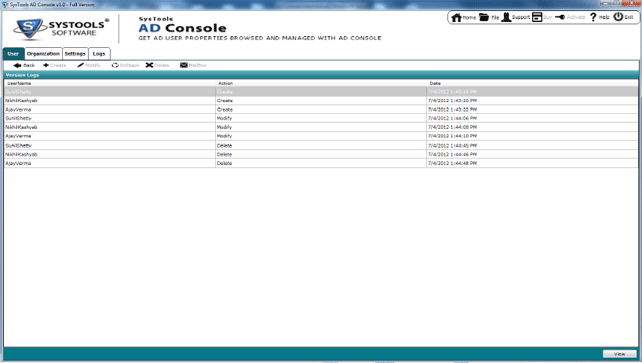 Step 14 : You can also add your own field if require, by clicking "Add Field" option. Note: The field that you want to add should not contain any space. Also if you add any field then it will not be removed from active directory. Step 15 : Now click on the "Generate CSV" button to make the CSV file so that it may be used for creating users, deleting users, modifying users, creating the mailbox for users. Step 16 : Now CSV file generated Successfully. 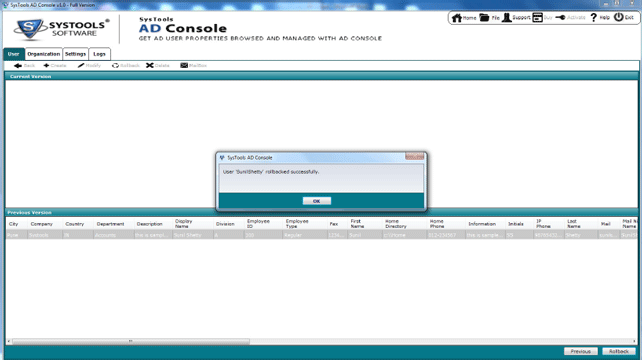 Step 17 : Create Users Click on "Create" and import the generated CSV file(generated from Settings tab). 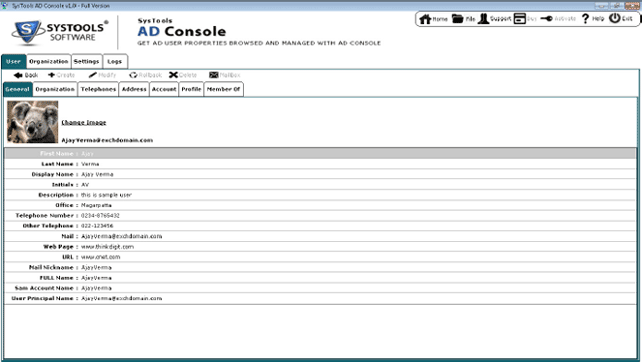 Step 18 : After importing the CSV file, you can see "CSV Field Mapping Profile" Window. 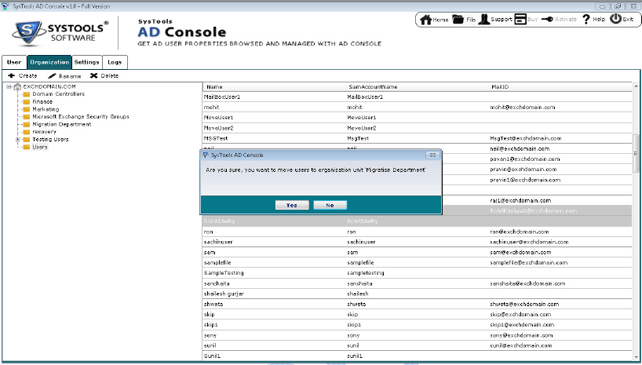 Step 19 : This profile screen is used for comparing CSV fields with AD fields. By default mapping is done in "Default Profile". To see the mappings for existing profiles, just choose that profile and click on "View" button. The mapping will execute. 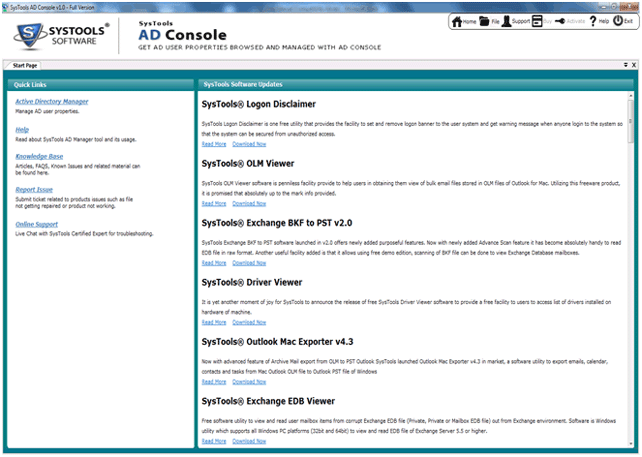 Step 20 : You can create a new profile and then define CSV fields map with AD fields. To create a new profile, click on "Add New" button and enter new profile name. 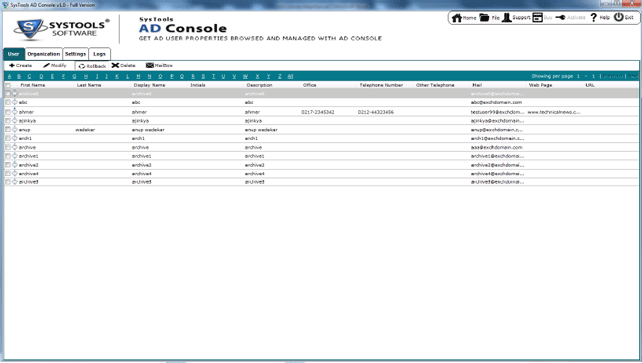 Now you can conclude which CSV field should map to which AD field and do the mapping accordingly this step. Now click on "Save" button. 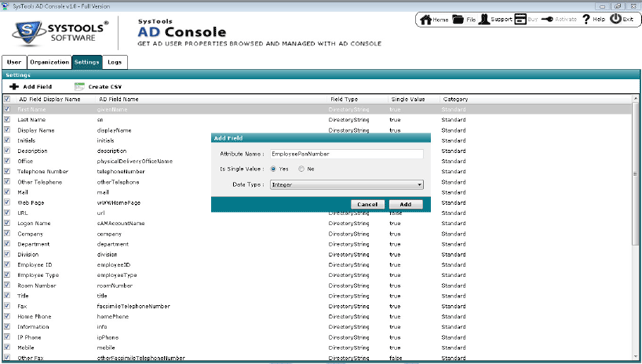 Note :- You cannot map numerous CSV fields to one particular AD Field. Also, you require doing mapping for all CSV fields. Step 22 : After saving the mapping, choose the profile that you want to use and then click on "Use Selected Profile" option. Step 23 : After choosing the profile you can properly set the account properties that you want to apply to all users that you will create and you require to choose organization unit (from tree view) where you want to create all users. Step 24 : After setting the properties of account and choosing the organization unit, click the "Start" button to start creating users. After clicking on the start button, you can see the "Current Status" window. 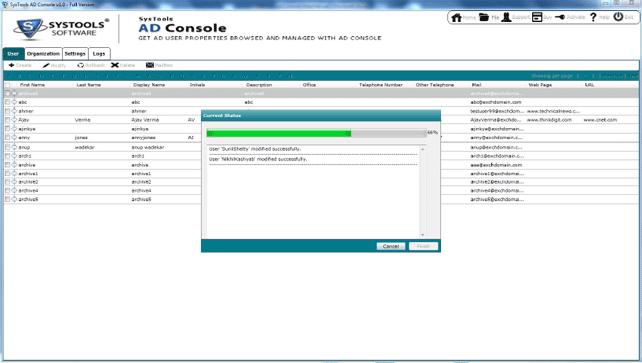 Step 25 : Modify Users Click on "Modify" option and import the produced CSV file (generated from Settings tab). 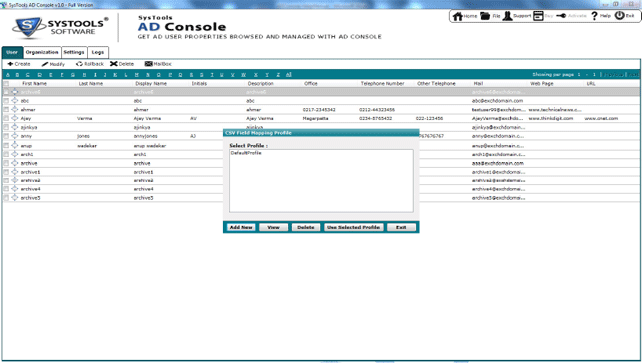 Step 26 : After importing CSV file, you will see "CSV Field Mapping Profile" Window. Step 27 : Now select the profile that you want to use and click on "Use Selected Profile" button. 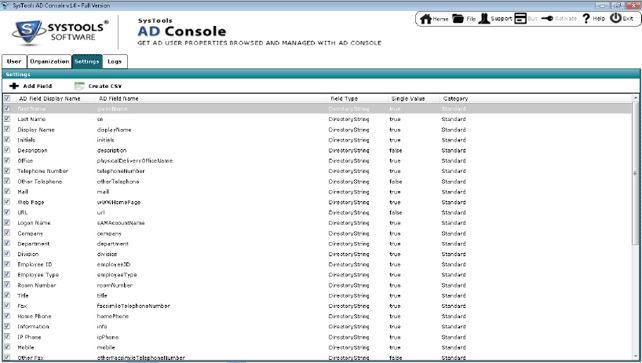 If you want, you can even create your own profile and map CSV fields to Active Directory fields. For this refer "Create Users" section After selecting the profile, the process of modifying users will start. You will check "Current Status". 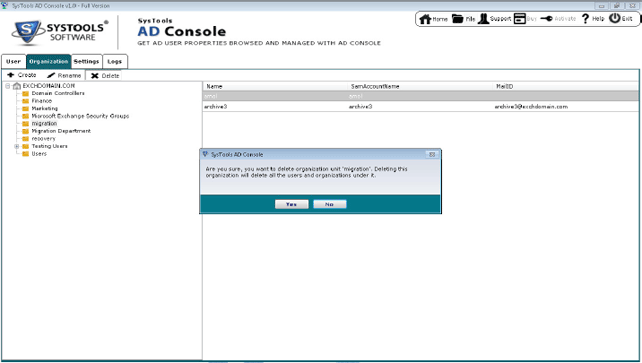 Step 28 : Delete Users:- Click on "Delete" button and import the generated CSV file (generated from Settings tab). Step 29 : After importing CSV file, you will see "CSV Field Mapping Profile" window. Step 30 : Select the profile that you want to use and then click on "Use Selected Profile" button. After selecting the profile, the process of deleting users will start. You will see "Current Status" window. Click on "Create Mailbox" button and import the generated CSV file (generated from Settings tab). 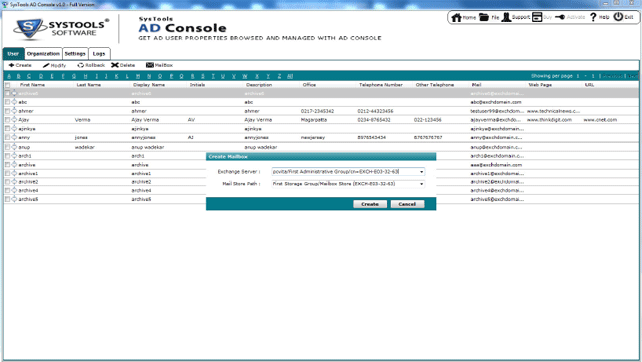 Step 32 : After importing CSV file, you will see "CSV Field Mapping Profile" window. Step 33 : Choose the profile that you want to use and then click on "Use selected profile" option. You can also add your own profile. For this invoke "Create Users" section. After choosing the profile, you will see "Create Mailbox" window. Here you have to choose the "Exchange Server" where you want to produce the mailbox and you also need to choose the "Mail Store" where you can store the created mailbox. Step 34 : After selecting "Exchange Server" and "Mail Store", click on "Create" option to start creating the mailbox. When you click on the "Create" option you will see "Current Status" windows. Step 35 : Rollback:Click on "Rollback" button. Step 36 : After clicking on the "Rollback" button, you will see "Version Logs" window. Here you can see the operations used so far like when the user was created, when user was modified, when the user was deleted and so on. Step 37 : After clicking on "View"option, you will see on the screen. Now in "Current Version" section, you will see the current information for that user. "Previous Version" section displays data of the version that we have selected to roll-back to. Step 38 : Click on "Rollback" button, to rollback the AD user. Q. How to make user mailbox creation easier on Exchange AD? Ans: In order to do majority of tasks on Exchange, you need AD. However, the management is not that easy and doesn’t come quick to admins especially between a jam-packed schedule. Therefore, using AD management software is the best option to manage user mailboxes on Active Directory in a simplified manner. Q. 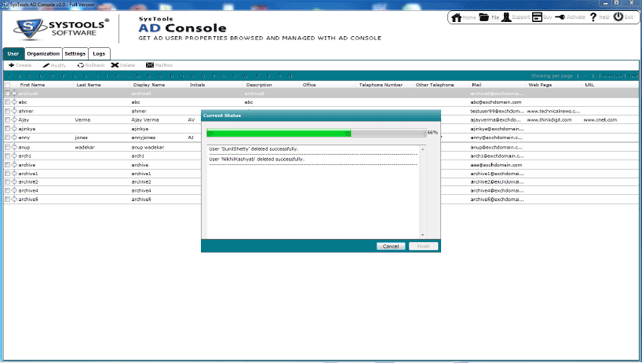 What is the method to speed up the management activities on AD? 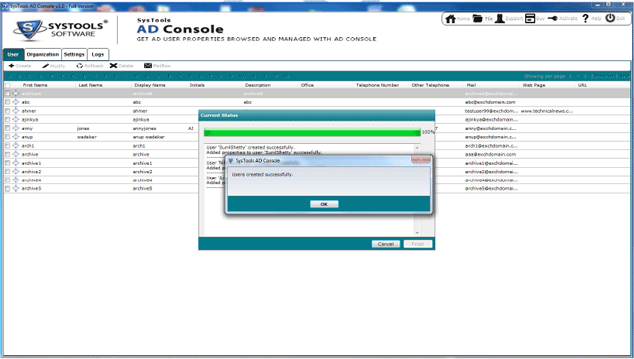 Ans: The only direct method of preventing the described technical glitches encountered with AD is to use AD Console software. 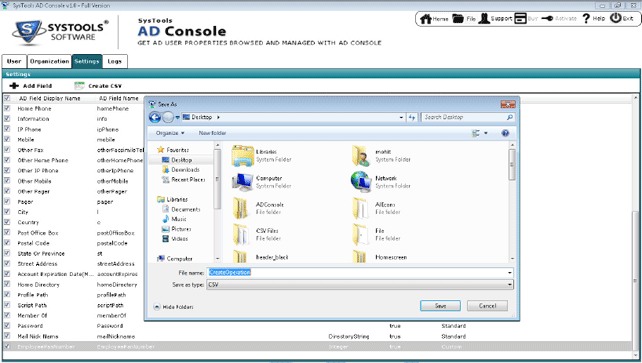 The active Directory Console product is quick and user friendly, moreover, features direct mailbox creation from the home screen only. AD Console is the best application I came across during my search for a tool to manage Active Directory. 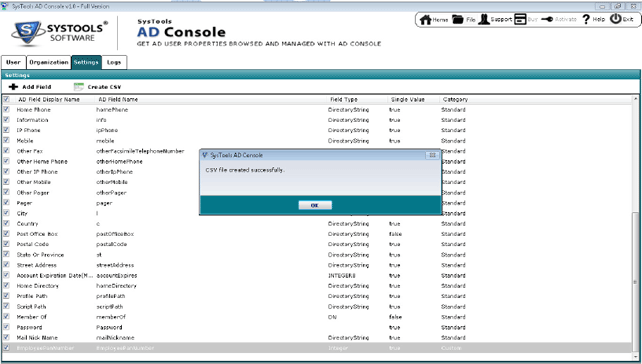 Using AD every time for user creation, modification, or other such regular tasks, was quite time-consuming. 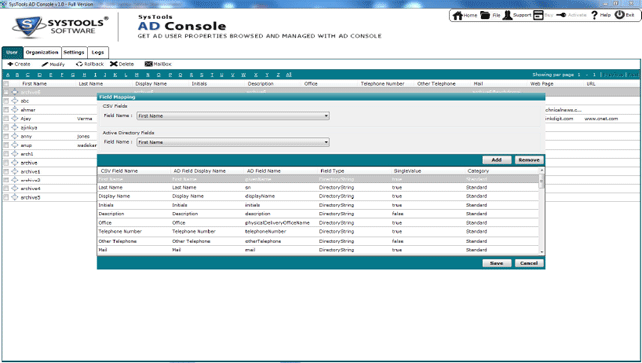 This Active Directory management Console Software has brought simplicity in life! Thank you Team, this is by far the most productive creation. Thank you for supporting my management team with tools that simplify technology to an extent that they do not have to do much during their day.